MP4 and WAV are two of the most popular audio file formats that common music players support. Sometimes you need convert MP4 to WAV or WAV to MP4 in order to get better quality, or want to play them on more devices. For example, you get some MP4 videos and want to play the audio in MP4 video on specfic audio players. To do this, you will need reliable software that works efficiently and retains the quality of the audio file being converted. This article will show you the best way to get this job done. Pavtube Video Converter Ultimate is highly recommended to you. With it, you can not only convert MP4 to WAV but also can transcode YouTube video, YIFY video, Torrent video, MKV, FLV and more video to WAV audio and other audio formats such as MP3, FLAC, AAC, OGG, MKA, WMA, etc. It even can rip Blu-ray and DVD to audio. Of course, you also can convert audio to another audio formats. To convert WAV to MP4, you can remove the original audio of the video and insert the converted audio file into the video. Moreover, you can merge multiple audio files into a single file and trim a audio clip to make a ringtone. You also can add WAV audio to MP4 video and loop the audio in video. This best MP4 to WAV converter can keep the perfect audio quality when converting audio files or extracting audio from video. Step 1: Install and open the best MP4 to WAV converter. 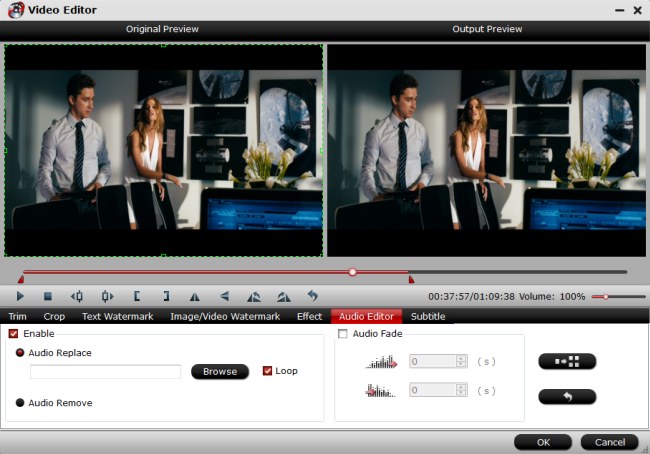 Directly drag and drop the MP4 files to the software. The batch conversion features allow you to add multiple MP4 files to convert to WAV. 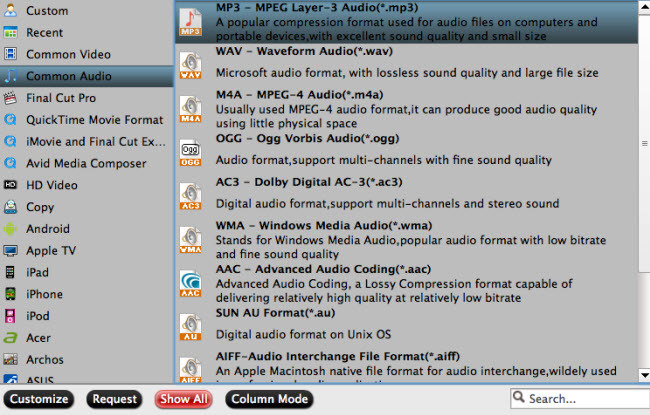 Step 2: Just click the "Format" > "Common Audio", then you will see all the audio formats (AC3, MP3, FLAC, WAV, M4A) we listed and others. Choose WAV format as your need. 1. If you want to merge multiple audio files, check "Merge into one file" option behind "Settings" button, you can merge the ticked files in list into one single file. 2. All formats here are set with optimized video/audio codecs, bitrates, frame rates, etc. But you can still specify as you like by clicking Settings button. In the Profile Settings window, you can choose or specify exactly the parameters you like. Step 3. For those people who want to replace or remove the audio in the video, you also can finish this task with this software. Load your video into this software, then click the pen-like icon on the UI. You will see 7 tabs in its pop-up "Video Editor" window, click "Audio Editor" tab, then check "Enable" to replace or remove the audio in the video file. 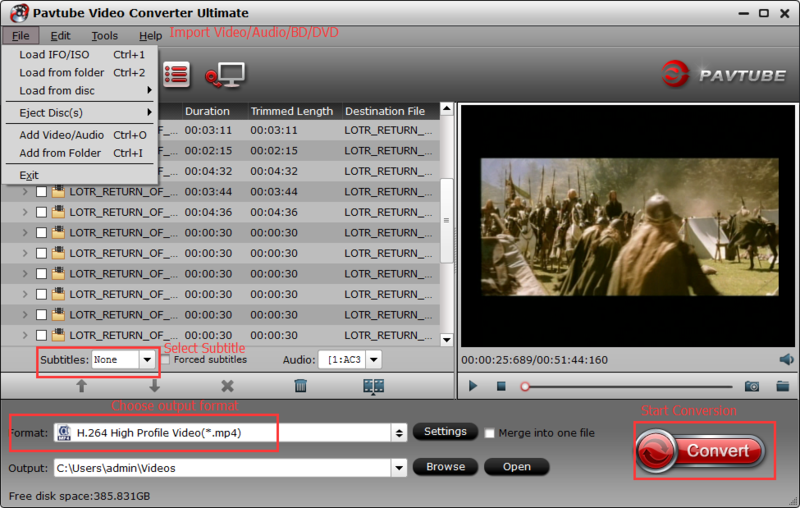 Step 3: Clicking the Convert button on main interface, you can go to MP4 to WAV Conversion window to start conversion. You can find conversion information on the window, such as Time elapsed, Time left, Generated size, and Estimated size. Ticking off Shut down computer after conversion option, you can leave the program running and do other things instead of waiting around for the conversion. Audio Mixer: How to Mix multiple audio tracks into one track on Mac?